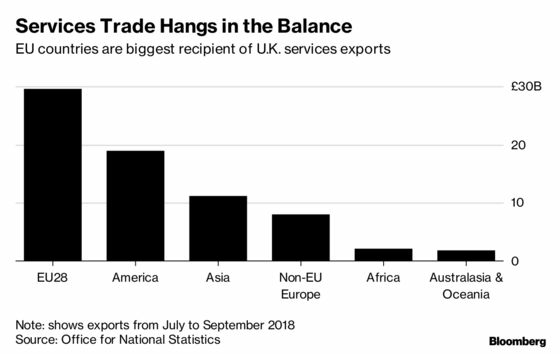 (Bloomberg) -- More than 40 percent of the U.K.’s services exports go to European Union countries, according to the Office for National Statistics, highlighting the importance of continued trade with the bloc for the largest part of the British economy. The sector -- which includes financial as well as research and development, architecture, engineering, legal and other services -- accounts for about 80 percent of the economy, and yet has largely been ignored in Brexit deliberations so far. The U.K. currently has harmonized standards and regulations with the EU for many services, a situation that could change drastically if the country leaves the EU as scheduled on March 29. The government has yet to agree on how they will exit the bloc. Currently, Britain has access to a market of over 500 million consumers, the free flow of data with the bloc and “passporting” rights, which allow financial companies to market products and services in any EU country without having to set up a branch there. There is also free movement of people, crucial for firms who employ European staff in the U.K. or send workers on trips to the Continent for things like installing software or drafting contracts. Prime Minister Theresa May’s proposed deal -- which has been rejected by lawmakers -- focuses mainly on trade in goods rather than services. If the U.K. leaves the EU with no deal in place, British services firms doing business in Europe will be subject to rules on a country-by-country basis.